Please join us in sunny San Diego, California for the 38th AIAA/IEEE Digital Avionics Systems Conference (DASC), the preeminent R&D Conference in the field of digital avionics offered by its two most distinguished professional societies, the Digital Avionics Technical Committee (DATC) of the American Institute of Aeronautics and Astronautics (AIAA) and the Aerospace and Electronic Systems Society (AESS) of the Institute of Electrical and Electronics Engineers (IEEE). In addition to having near perfect weather year-round, San Diego offers plenty of educational, cultural and recreational opportunities for everyone to explore around the conference. Venture out to Balboa Park for an evening enrichment, enjoy gaslight dinners at the historic downtown, wind down at the beaches along 70 miles of spectacular coastline or have a family outing at the world-famous zoo. We are positive that you will have a memorable and educational experience at the 38th DASC. Artificial Intelligence (AI) and machine learning are transformational for the commercial and the consumer industries. Drones and ground vehicles are relying more and more on sensor data fusion with AI to improve safety. The focus of the 38th DASC will be to explore how AI and machine learning can be applied effectively to various aspects of Air Traffic Management (ATM) to improve safety, capacity and performance. 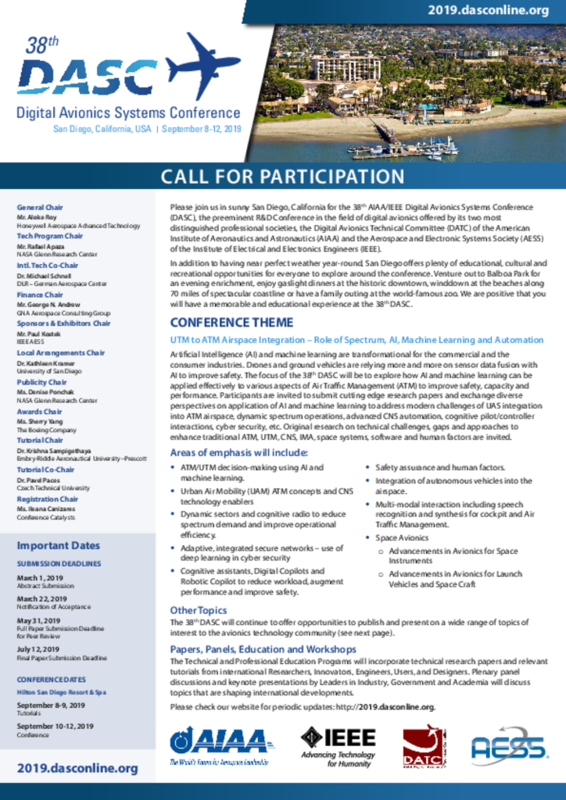 Participants are invited to submit cutting edge research papers and exchange diverse perspectives on application of AI and machine learning to address modern challenges of Unmanned Aircraft Systems (UAS) integration into ATM airspace, dynamic spectrum operations, advanced Communications, Navigation and Surveillance (CNS) automation, cognitive pilot/controller interactions, cyber security, etc. Original research on technical challenges, gaps and approaches to enhance traditional ATM, UTM, CNS, IMA (Integrated Modular Avionics), space systems, software and human factors are invited. ATM/UTM decision-making using AI and machine learning. Dynamic sectors and cognitive radio to reduce spectrum demand and improve operational efficiency. Cognitive assistants, Digital Copilots and Robotic Copilot to reduce workload, augment performance and improve safety. Safety assurance and human factors. Integration of autonomous vehicles into the airspace. Multi-modal interaction including speech recognition and synthesis for cockpit and Air Traffic Management. The 38th DASC will continue to offer opportunities to publish and present on a wide range of topics of interest to the avionics technology community. The Technical and Professional Education Programs will incorporate technical research papers and relevant tutorials from international Researchers, Innovators, Engineers, Users, and Designers. Plenary panel discussions and keynote presentations by Leaders in Industry, Government and Academia will discuss topics that are shaping international developments.